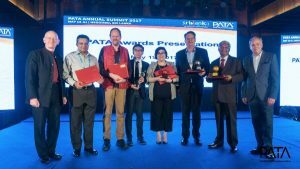 The Pacific Asia Travel Association (PATA) has presented a series of awards in recognition of contributions made to the responsible development of travel and tourism in the Asia Pacific region. The PATA Awards of Merit are reserved for individuals who have consistently contributed to PATA and the PATA Chapter network over an extended period. This award was presented to Mr Peter Semone, managing partner of the strategic advisory organization, Destination Human Capital, and founder of the internationally acclaimed Lanith – Lao National Institute of Tourism and Hospitality vocational school in Lao PDR. Mr Semone has also acted as Chief Technical Adviser and Team Leader for European donor and Asian Development Bank projects. He also consults for United Nations agencies including the World Tourism Organzation (UNWTO) and the International Labour Organisation.